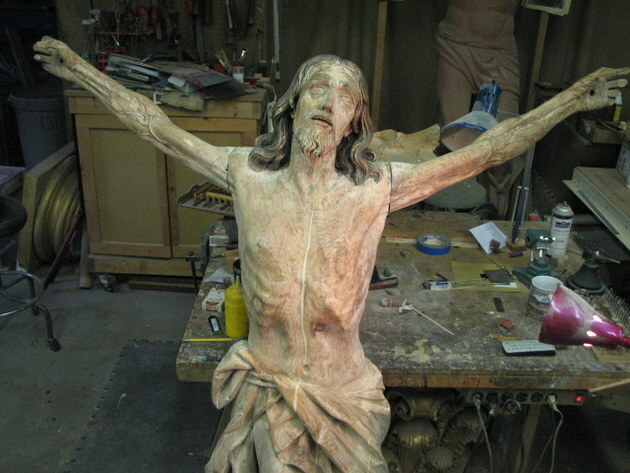 This Corpus was the original Crucifix in the Church. I first went there for some other work and as an after thought they asked me to look at this piece. 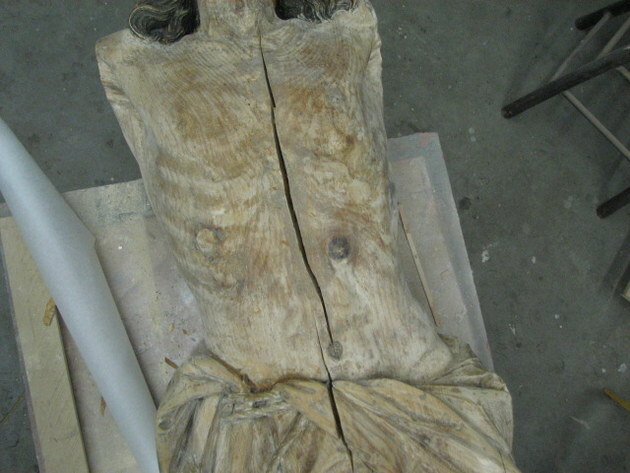 For whatever reason they removed this piece and had it stored in the basement. 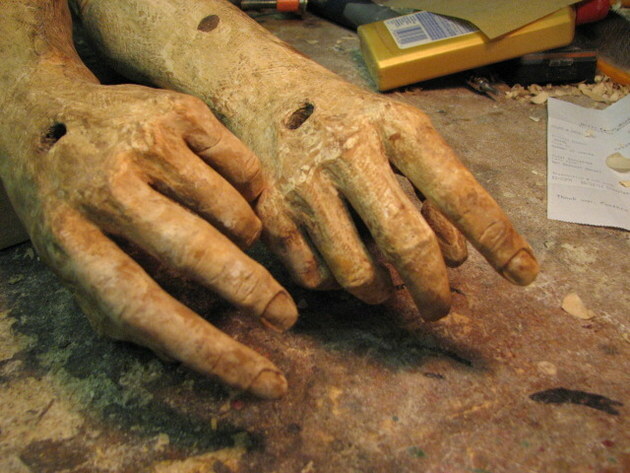 As luck would have it they had a flood and this body was found floating around in all the muck. 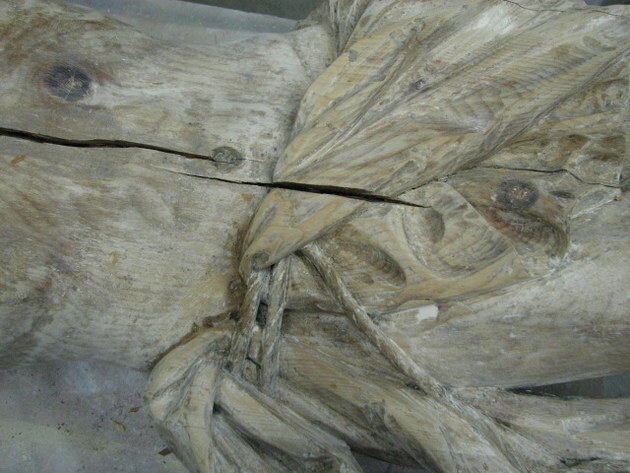 Time and the flood caused it to crack right down the middle and the arms, which are normally separate suffered damage as several of the fingers were cracked and missing. It’s my job to restore it, make a new cross and get it back into the Church. 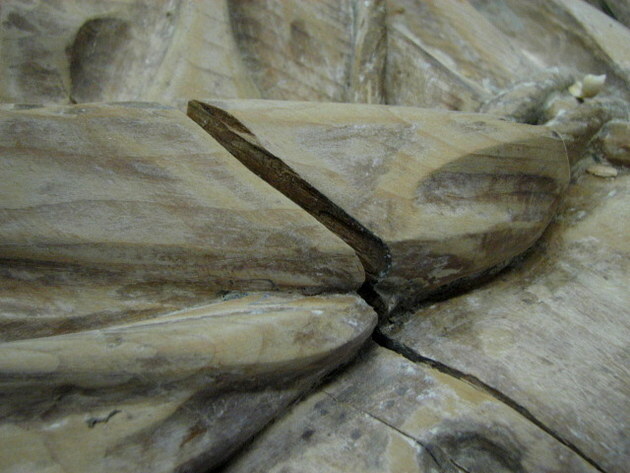 This isn’t so much about carving as it is repairing one that has been damaged. 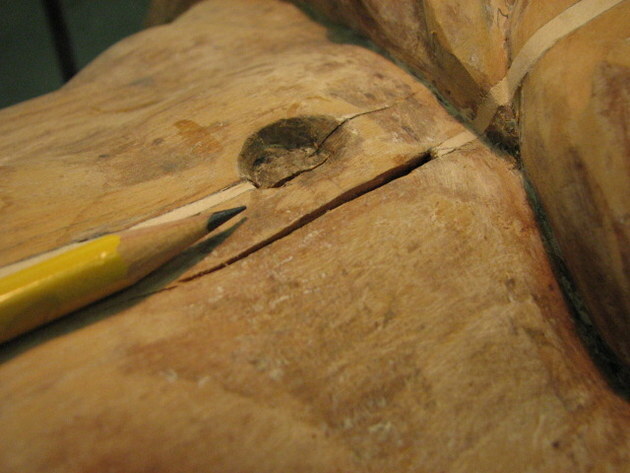 To fill cracks the first idea is to grab some putty or filler and just plug up the cracks. I don’t tend to favor this approach simply because wood is always moving. I feel that if I just pack some filler of whatever type into the cracks it won’t be a permanent job. Wood, by its very nature continues to move. 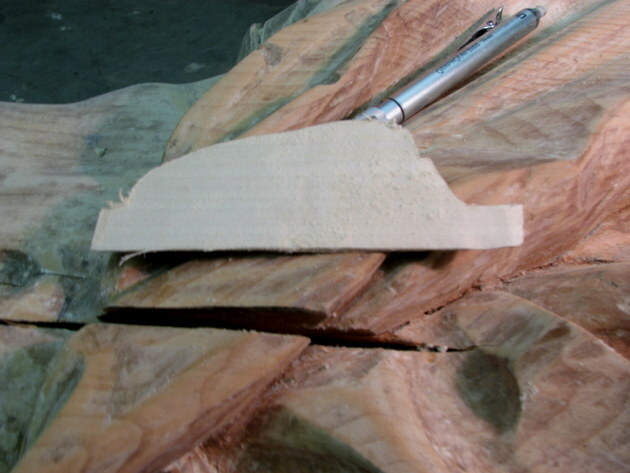 With this movement a solid filler won’t expand and contract in the same manner as the surrounding wood. So my go to solution is to use wood as the primary filler. Granted it takes a bit more effort than using some putty and just sanding it flush but to me, this is a more ‘professional ‘ repair. 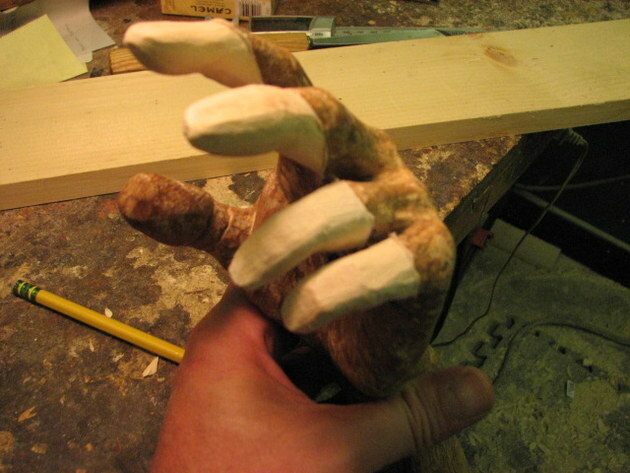 The fingers too needed to be remade and since the carving was done in a pine,, I used pine for the fingers as well. 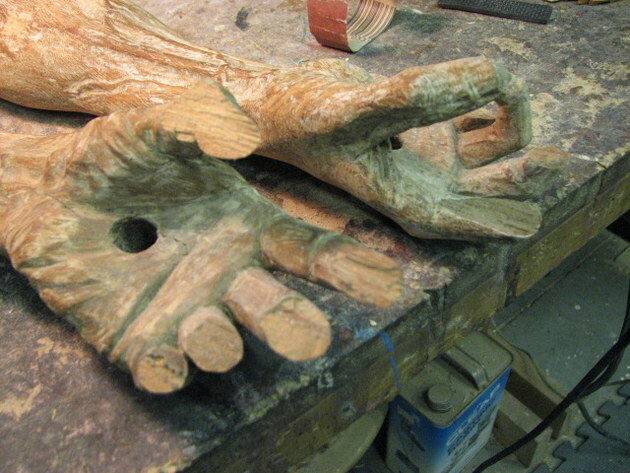 Ultimately it wouldn’t have made a big difference since the piece will ultimately get painted ( not so much painted as it will be a wash type finish to show age and the wood) but for some reason it just made sense to me. 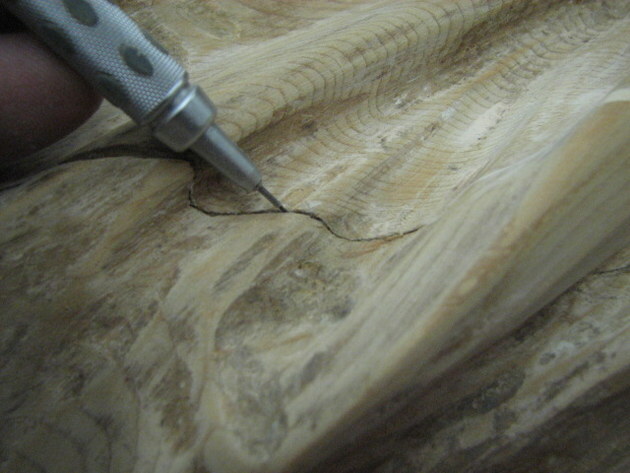 The photos show the basic process which entails making a template of the crack then band sawing out the profile. 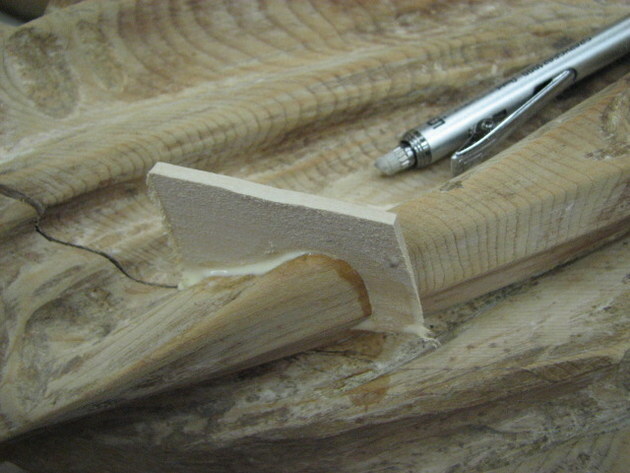 When I band saw the outline of the crack I tip the table of the band saw a couple of degrees in order to have my insert have a slight wedge shape to it as I cut it from each side. 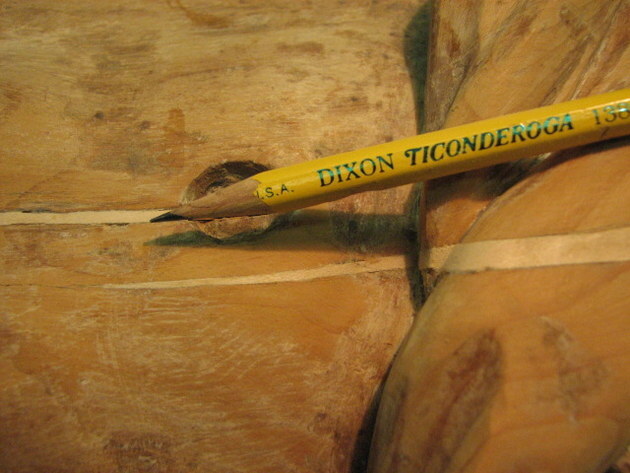 To make the pattern I simply use some tracing paper ,, the edge of a pencil swiped over the crack which is covered with the paper and it reveals a perfect profile of the crack. 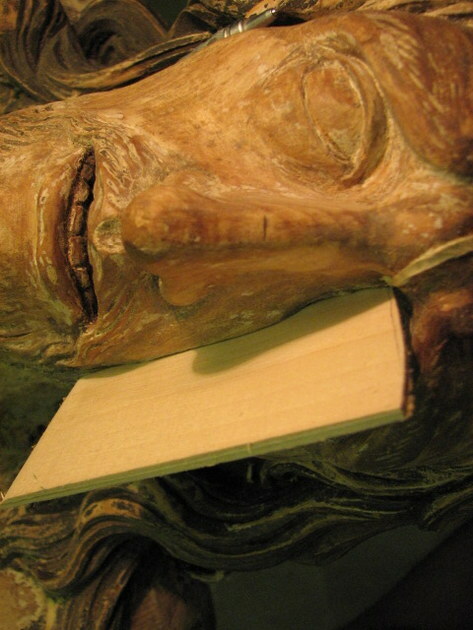 Transfer that to a piece of wood, band saw , a bit of sanding and you’re ready to glue it in place. 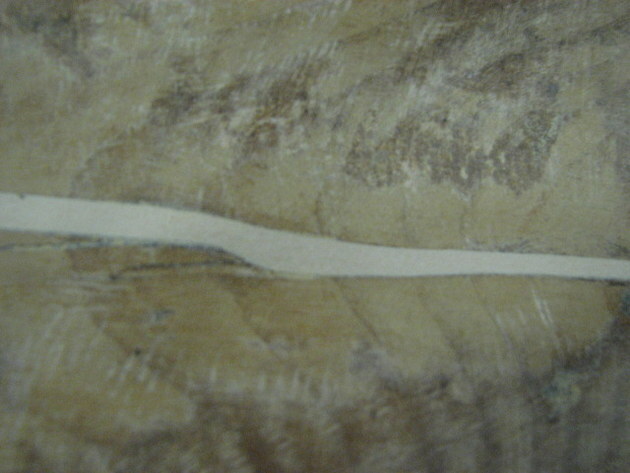 Here you can see the severity of the crack running nearly the entire length of the body. Here is the area from the stomach to where the cloth is. 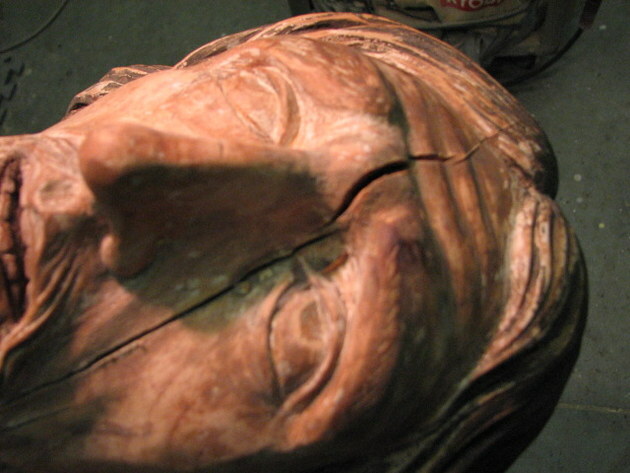 The same area after the repair. In this case I had to use two pieces of wood to fill this one crack as the length and curve was just too much for one single piece of wood. 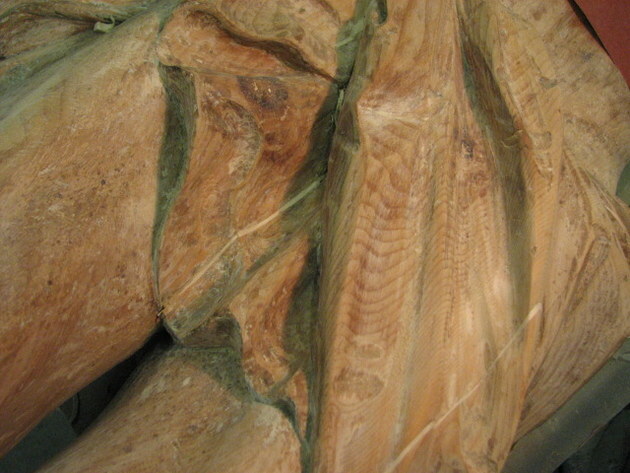 Close ups showing just how accurate this method can be if a bit of care is used. 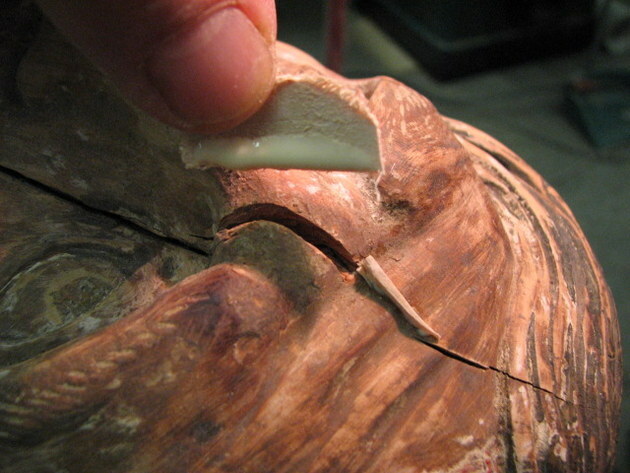 This crack at it’s widest was nearly a quarter of an inch wide tapering to nearly nothing. 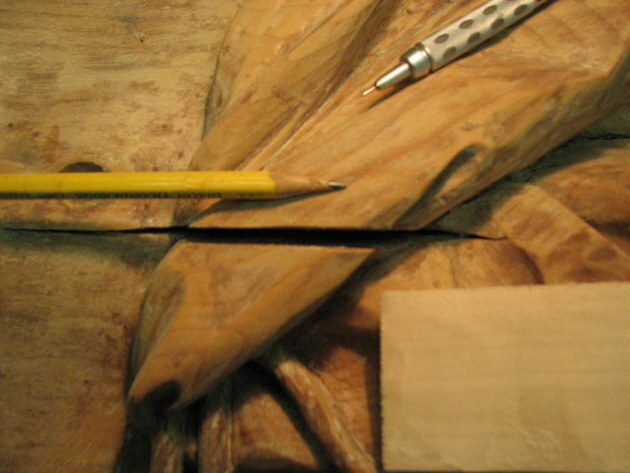 Here is a split in the robe and you can judge from the pencil the size and length of the split. 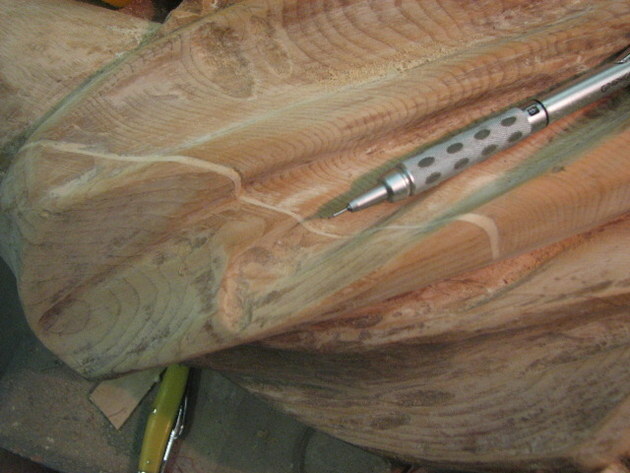 Having to go over such areas can prove a bit of a challenge but since the crack itself is tapered the method I described to cut the filler piece naturally accommodates these irregularities. 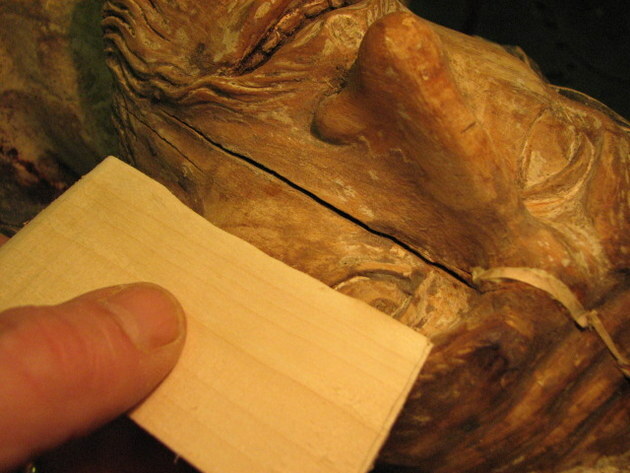 The sequence showing the crack, the filler piece, trimming the piece to a rough profile and then gluing it into place. The naval area as well as seeing how sections need to be in two or more pieces. 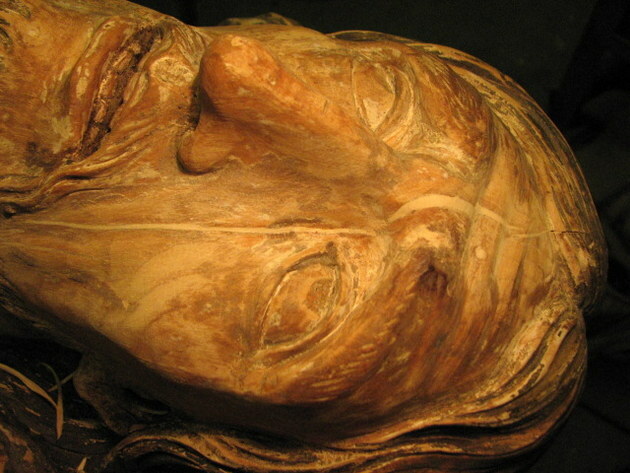 As I said, the split ran the length of the body including the face. 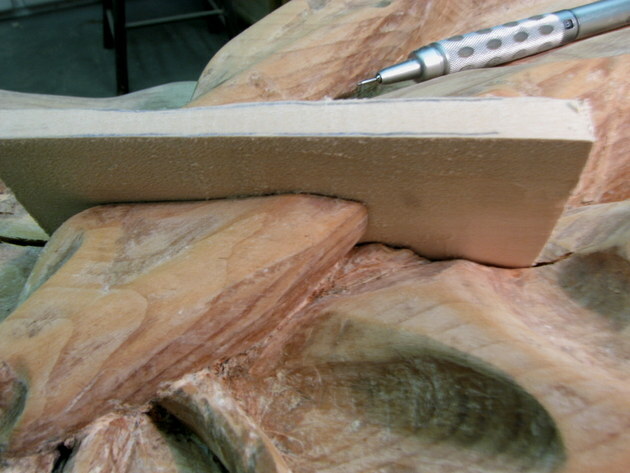 Difficult to see from this angle but this piece of stock has been cut to follow the profile of the split. Awkward as it may look the piece fit perfectly. Once trimmed, carved and sanded a bit it worked out quite well. Just a variety of cracks and you can judge the relative size that needed to be filled along the way. 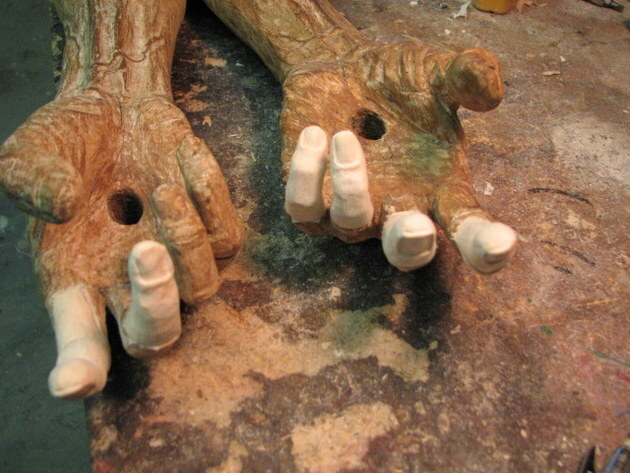 The torso has been filled,, now on to the hands. A bit of a mess as most of the fingers are missing but that’s what I’m here for. Using my own hand as a model it gives me the direction need to go in order to make fingers in the proper pose and curvature. 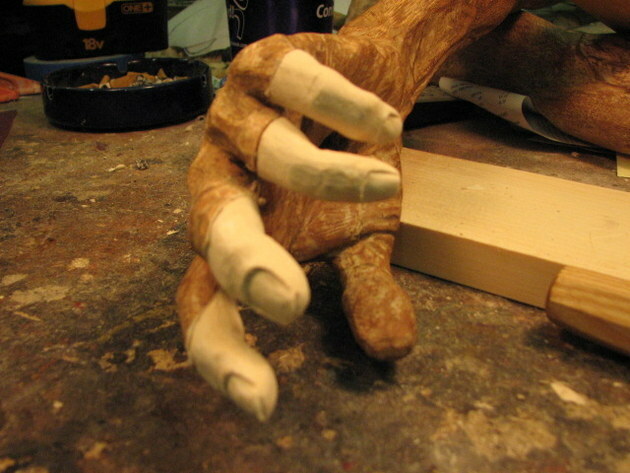 These are just in the initial rough in stage in order to find the proper curves, joints and direction all the fingers should follow. 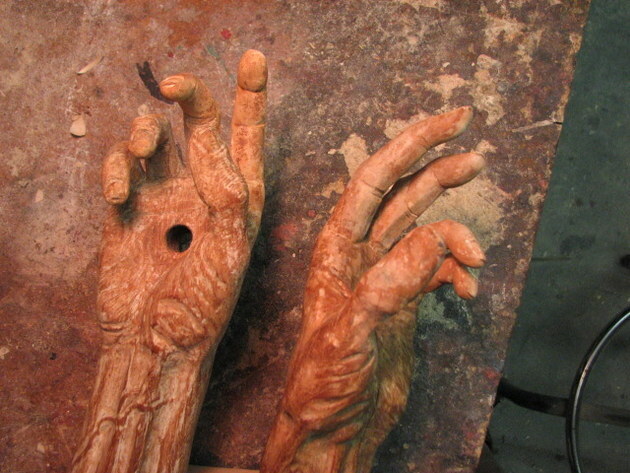 Various angles and shots during the sequence of carving the fingers. During most of the process I use double sided tape to hold them temporarily in position until most of the shaping is done. 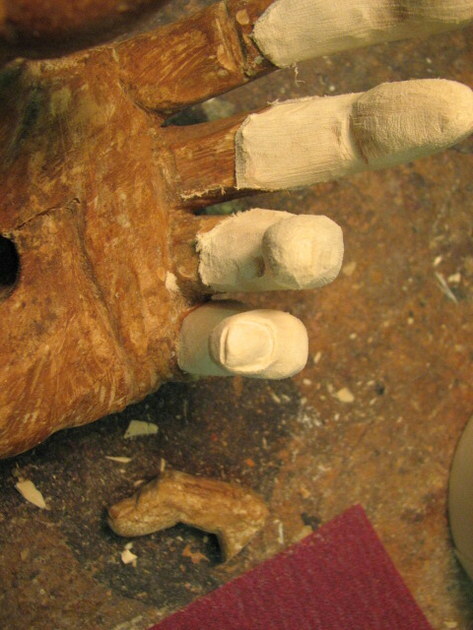 Then I start gluing from the middle fingers and move outward so I have access to as much of a finger for the final shaping as possible. I did paint them to roughly imitate the finish on the rest of the body. The reason I did this , even though I plan on a more complete paint job is that I don’t want the very light color from the fresh wood to “ghost” through my final paint job. I do not plan to give it a complete solid color finish and what I plan would in all probability show thorough quite easily. I used regular yellow ( Titebond) carpenters glue. Other glues could have been used but as far as ‘absorbing’ movement it’s not an issue simply because if everything is moving at the same rate nothing is really to be gained. All grain is the same direction , the fit very tight so it’s essentially all one now.Then too I’ve worked on pieces that have used these other glues and it turned out they were the reason for the failure and needed repairs. 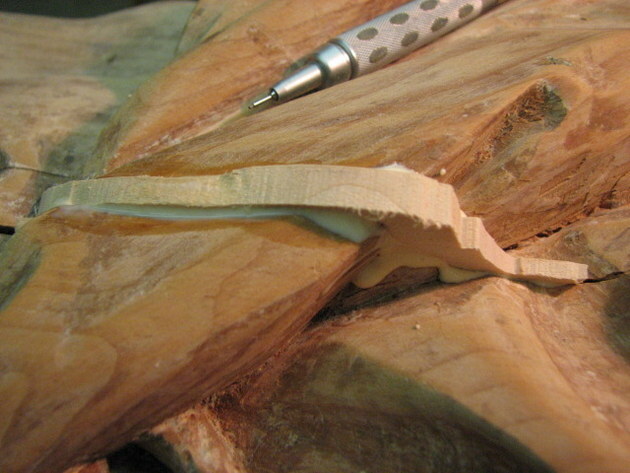 They,, as well as Hyde type glues are terrific for a piece that may need to be taken apart ( such as a Violin) in the future but not in a case such as this.I’ve used this same technique for pieces done for Sotheby’s and they passed with flying colors. As to seeing a filler under a wash of paint it may not bother you nor I,, but when you have a congregation looking at a rather pricey restoration and they see an obvious stripe of filler it may raise quite a few objections. In essence ,, ” You did the work and we can see a patch,,, why didn’t you blend it in?” Even if the finish will not have the piece look as if it’s brand new,, which I don’t want. I’ve dealt with too many people,, congregations,, committees in my career and have learned better not to leave things to chance such as this. Believe me,, it doesn’t fly with the general population for the reasons I mentioned. 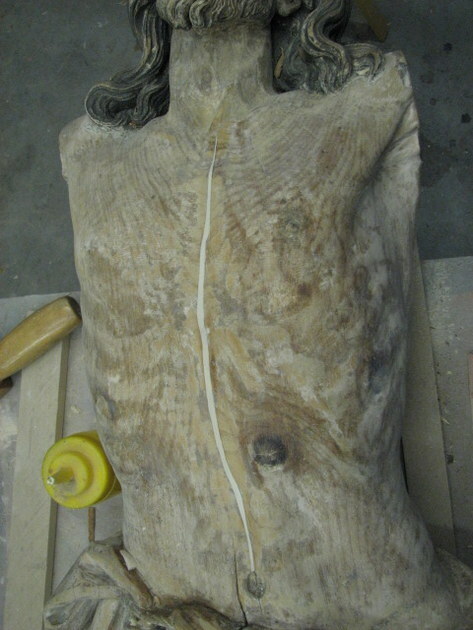 If this piece should in the future need restoration it will be rather obvious as to what was done and in all probability the areas I repaired should hold up. So any other repairs will be handled in their own fashion at that time. Repairs are repairs. You do what you need to do to resolve whatever issue is at hand. 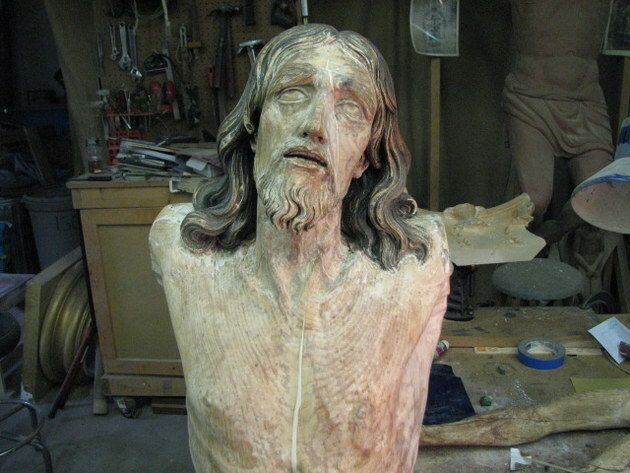 On occasion I get pieces that have been restored and I really don’t care what was done simply because I have to address whatever damage has been done and go from there. Ironically many of the pieces have been “repaired” in less than optimal ways so I have to remove any patches and do a proper repair from that point. Thank you Mark for showing us another job well done, and the techniques you use. 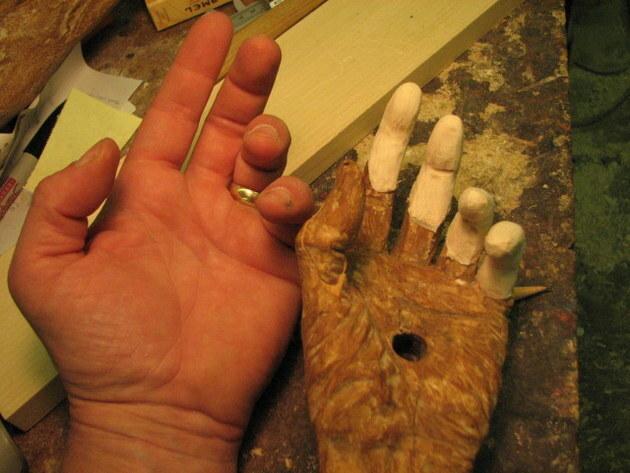 When you glued the fingers back on, you did not use a dowel to attach the fingers? Did they not need any extra support? 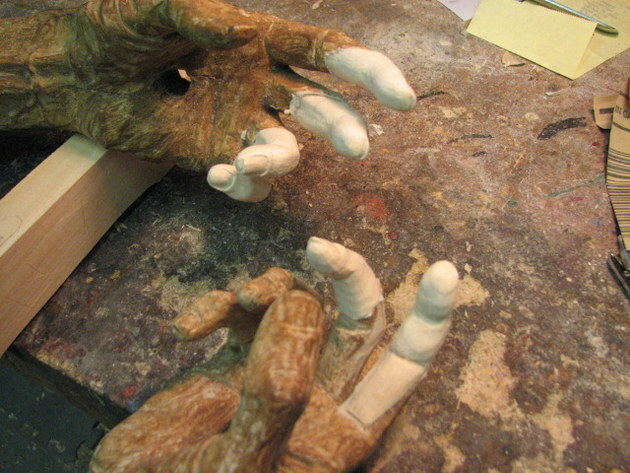 How did you clamp the fingers while the glue was drying? Keep up the great work, we appreciate all of the time you put into this blog. Thanks Todd, my pleasure. No , I didn’t use a dowel in this case. 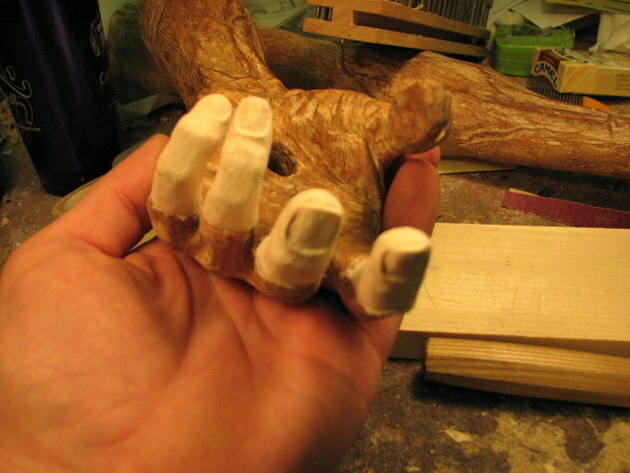 Since I was able to flatten the broken fingers pretty much dead on,, and the pieces I used to carve the fingers were just as flat, a solid glue joint was a good fit. 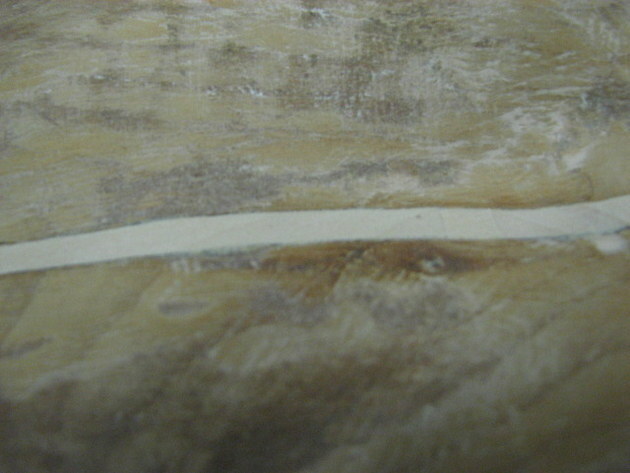 I also oriented the grain in the same directions , which happened to be with the grain, that this also gave a great joint. 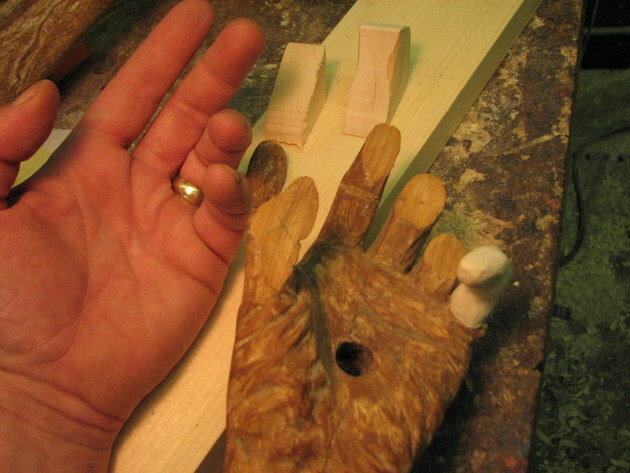 If I were going against the grain I may have opted to use small dowels as a bit of added insurance. Also,, I used my all time favorite epoxy , Devcon which I can’t be without, and this in itself pretty much guaranteed a solid fit. If it breaks anywhere it won’t be at this joint. Since the fit was pretty much perfect, and the quick setting epoxy I used , I was able to hold/press them into position as they set up.I can usually find any number of ways to clamp things but fingers are a real head scratcher. Thank you Mark for your reply. I have used devcon 2 part epoxy before, but not on wood. I will have to remember that. 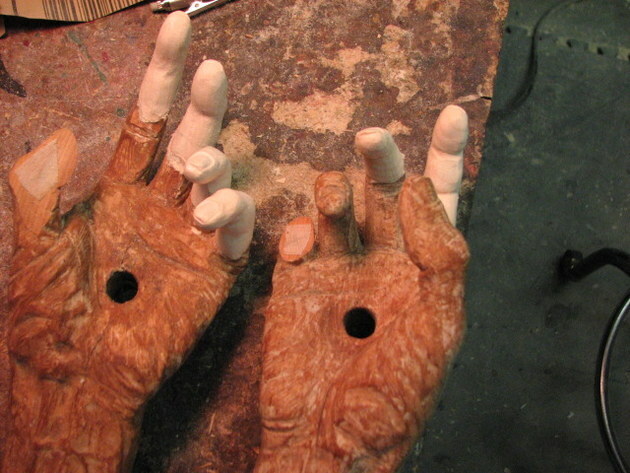 Clamping the fingers, I was wandering what you had come up with, now I know.